Spice up your next performance with this sassy Spanish fusion fan choreography! Ansuya takes popular belly dance moves, then adds a Spanish Gypsy flair, borrowing from latin dance forms like Salsa and Flamenco. The result is fun and entertaining for performer and audience alike. 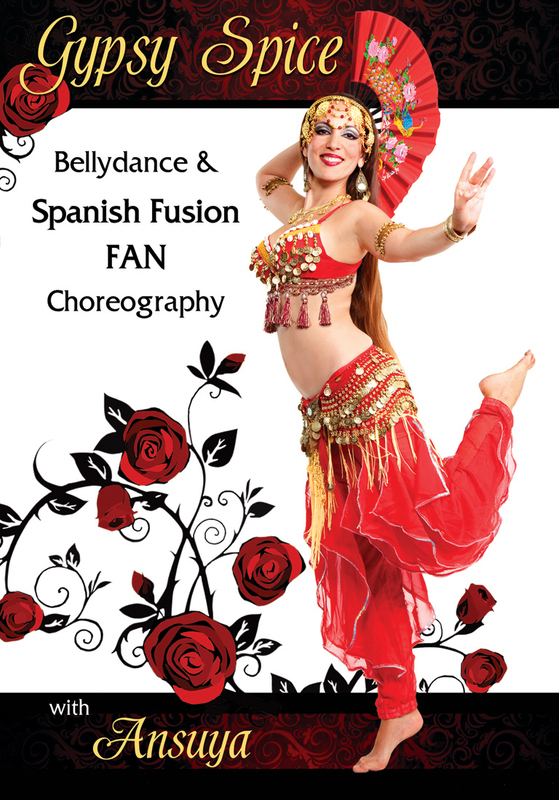 This program is perfect for any belly dancer who wants to add a new dimension to their vocabulary, Ansuya teaches a series of fusion combinations that can be used alone, or put together to complete the dance. This video includes: fan basics, choreography demonstration, pre-dance warm-up, instruction for 8 combinations, combination follow alongs, choreography follow alongs, cool down, and performance. So what are you waiting for? Pick up your fan and show off your Gypsy Spice! Ansuya presents perfect instruction to the choreo. This will be fun to learn and very pretty to watch.